When I return the 10-foot box van that I am driving now, I was intending to rent a 15 footer in order to find out how that size feels. However, because of my hurt wrist, I am unable to move my stuff out of the 10 footer. So, I have made arrangements to keep the 10 footer as a tow vehicle for Scampy. The highest priority thing to do on reaching San Diego, is to go to Kaiser Medical and get my left wrist look at. I was thinking that I may have broken a bone in my wrist because I have been diagnosed as having osteoporosis. However, since that osteoporosis diagnosis about four year ago, I have not broken any of my bones. After purchasing my box van, I will build a room inside the van about the size of Scampy. That room will be insulated and contain an Olympian catalytic heater for warmth. I am also considering a Nova Kool refrigerator with a freezer! This volcano is such a large size, that it kinda seems like its very close to the location where Little iPhone captured this pic. Actually, it is 50-miles distant. Shasta is an active volcano and erupts about every six hundred years. 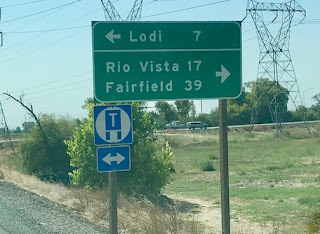 Ahead of us, we saw the off-ramp to the Town of Lodi. So, Box Van took the ramp. We figured that you might like this little story about stopping near Lodi. Creedence Clearwater has a song about Lodi. We like this Creedence Clearwater song a lot. Please click this [Link] to listen to Creedence Clearwater sing, "Stuck In Lodi Again". We are in the highway town of Buttonwillow, about 27 miles west of the City of Bakersfield. Our Nite Camp is away from the noise of Interstate-5. I hate to try and sleep in a place with traffic noise. Somewhere not too far south of where we are now, is the site of MsTioga's terrible accident! You may recall that in March 2015, MsTioga ran off I-5 when I had a heart attack and passed out while driving [Link]. Planning (for whatever reason) is what keeps our minds sharp. The roof of the box van would be perfect for solar panels! You might even be able to run an apartment size conventional fridge. Yes! You are so right about solar on the roof. I am planning to use a Nova Kool fridge. You might try an ice pack on your wrist. My wrist was so painful I went to the doctor and learned that the base of the thumb is a prime place for arthritis and, since we use our thumbs quite a lot, it can become inflamed very easily. It's easy to ignore the pain when it's slight but it just gets worse and then its unbearable. The wrist is actually getting better! Only hurts if I twist my wrist. Which I only do by accident. Know your limitations (at any given time) and hire projects done and just a helper for a day or two. You can always drive to a "Day Labor site", hire a helper and complete your project for the day in a Home Depot parking lot. Parts and materials handy. So, you think that I may need help? If it's unloading my current rented box van into my purchased box van, you may be right! I'm not saying you do not have the skills but some jobs are better handled with two sets of hands. Just consider yourself the foreman of the job and let someone do some of the grunt work. Hi George.. I have NO doubt you will buy the Box Van and build it out. It is amazing the variety and ingenuity that others have done with their box van. Besides the solar panels one fellow placed a 5 or 8 inch diameter pvc pipe along the side of his roof. He painted it black and hooked a hose to fill it. Then another water line inside for his hot water shower! A common feature seems to be leaving about 2 or 2.5 feet at the back for propane tanks and gas for generators. A door at the very back and vents at the floor are usually part of these. I have been amazed at the electronics and electrical outlets included. I am looking forward to your design and build... I know you will be happy. Having only one vehicle is certainly a plus, and the Box Van will allow you to get into the places you love to go. "Yes he can.. Yes he can!" I am looking forward to my design too! There should be a number of videos & maybe even some old fashioned written word & pictures about turning a cargo trailer into living quarters. About your wrist. you did a lot of work moving your stuff from one truck to the other, maybe thats the reason it hurts. In reference to buying the U haul truck, engine condition is important obviously, but dont overlook the automatic transmission. very costly to rebuild or replace. have the fluid examined by someone who knows what they're looking at. pink is good, but upon closer inspection tiny grey particular matter or particles may be visible. this indicates level of wear or if anything serious is wrong. if so this is a good time to find out. either walk away or use as a negotiating tool. btw, I share in your excitement on the new build. saved it because I needed it recently when I reinjured my hand! I am so excited about starting my new quarters inside Box Van. Also, anxious to be shopping for Box Van. Seems that lately I have been spending so much time driving back to San Diego! George, read RVSue's journal about her sister's issues with a box van rental. I don't know which company but it was a disaster. If you plan to purchase one from one of the rental companies, get an independent inspection. Good luck. I hope it is not your wrist but an arthritic thumb. It was Budget. Disaster is putting it mildly. I was happy they made it safely. There is no way that truck should have been on the road. Let alone a one way rental across the country. Working as an usher at the Kansas City Municipal Auditorium, I was able to enjoy a Credence concert. I was all of 14. What a great memory for you! We recently heard an interview with John Fogarty (of CCR). When the song was written he had never been to Lodi, just liked the sound of it! I, like many of your followers, are looking forward to your box van project. It will be your project, and will be unique to you only, not a copy of somebody else's project. Wow! Thank you so much for your confidence in me! It seems like you like to keep things simple. I not so sure you need elaborate plumbing and electrical. Less thing to go wrong.